Here we are! 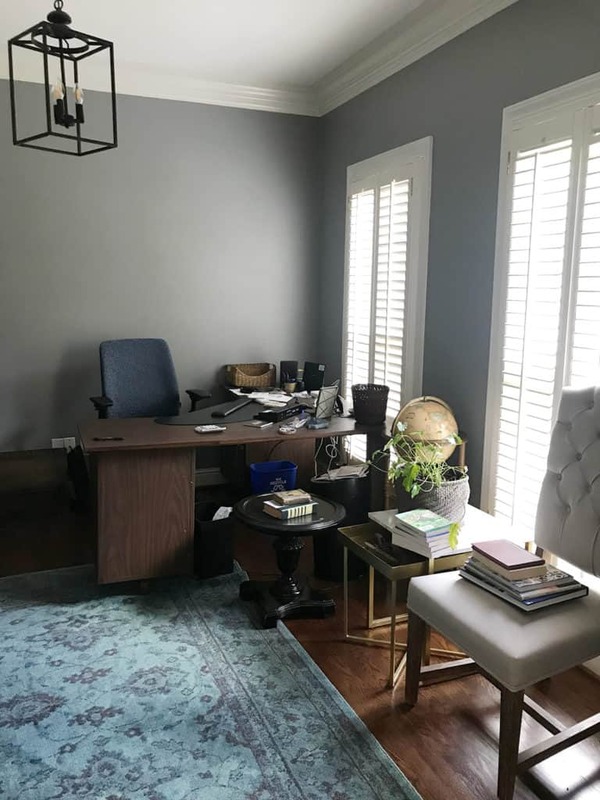 Week 6 of the One Room Challenge and the big reveal of our new library home office space. I am most excited that the room looks almost exactly as I envisioned it 6 weeks ago. It was actually two years in the making for this room to have it’s day in the spotlight. If this is your first time here, welcome! I’m Leslie. 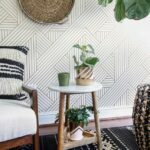 A full time blogger, designer and renovation junkie. This is my fifth One Room Challenge so I might could say I’m a certified ORC junkie too! So without any more delay, the library is open come have a look around! 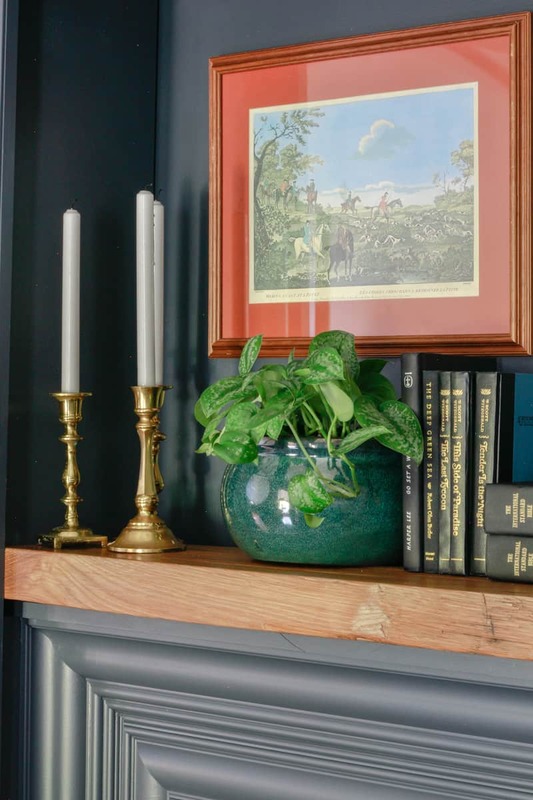 One of the longstanding visions and purchases we made for this room took place before we even moved into the home we call #theTrailHouseReno. 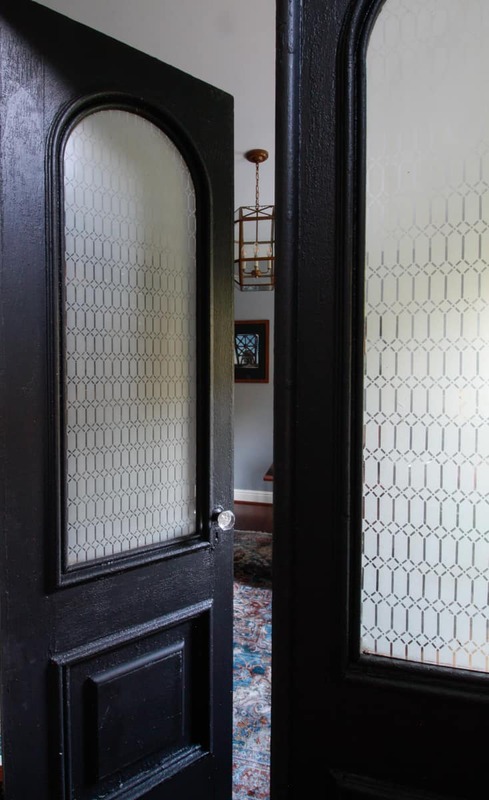 It was this stunning pair of antique doors I painted black to create a cohesive look in the foyer. 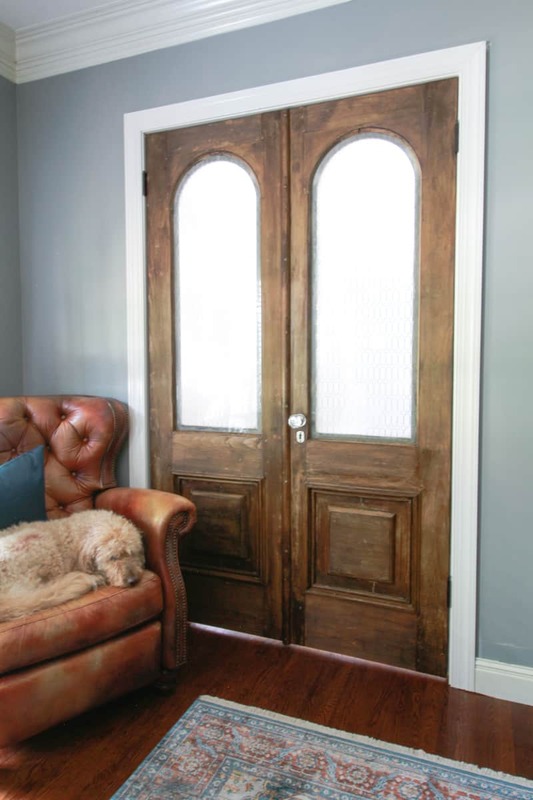 These french doors were from an old building in Nashville. I acquired them from Southern Accents Architectural Antiques in Cullman Alabama. When you come in close, you can see I left all of the history and charm of the original, crusty layers of paint on the outside. Just a coat of stain blocker and a black matte paint with red undertones Caviar by Sherwin Williams. I chose to paint instead of strip the outside because the damage was so severe to some of the trim it needed to be replaced. 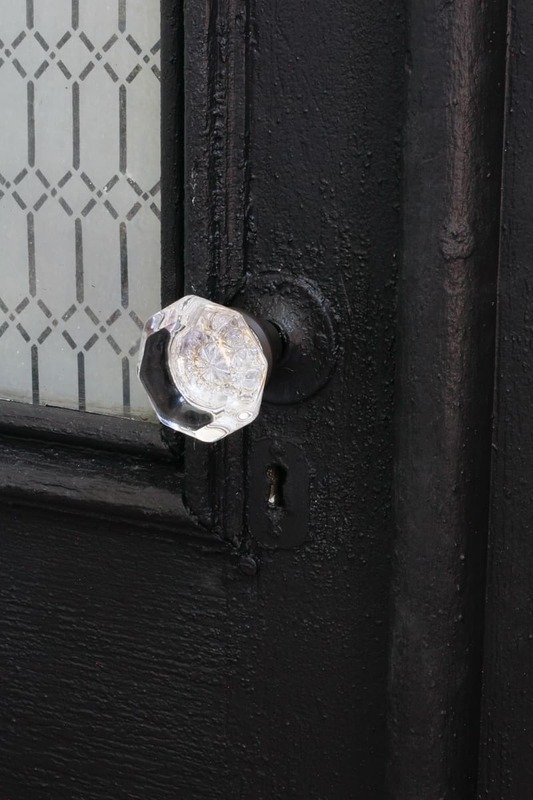 Unlike most of the wood work on the door, the pieces that needed to be replaced entirely were basic half-round trim. What I didn’t know before I had made the decision to paint them for continuity in the foyer, was how much instability the stripping process created. I am certain if I would have stripped the outside, I would have lost many of the irreplaceable details. After the doors, it is hard to pick favorites. I kind of love it all. I am a DIY mom after all. I love adding meaningful art or heritage pieces to my designs. Rooms should do more than be comfortable and welcoming, they should share your story. Not only did this DIY come out even better than I had hoped, I will treasure it most of all because my Dad and I worked on the ladder together. The final week of the challenge coincided with our son’s college graduation. He and my stepmom were here visiting and he expressed a desire to help me with one of my “projects”. This is was our first time to build together and I must admit we made a terrific team. We shot tons of photographs and video to share in a tutorial at a later date. I was determined to add a ladder to the library wall and was equally determined not to use one of those extremely expensive ladder kits! 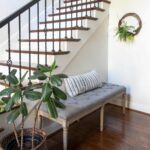 I am also happy to report that the cost of the ladder and hardware was a fraction of traditional systems produced by woodworking companies with an equally beautiful craftsmanship and finish. And the best part is this project shared by my dad and I became part of the story of the room too! 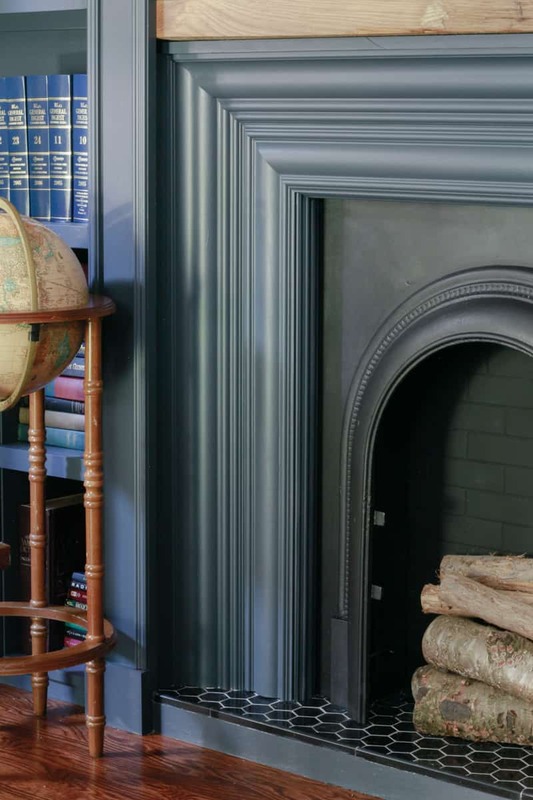 The design of the faux fireplace surround and mantle started with the antique arched fireplace insert. The rusty iron piece was also from Southern Accents. In a small courtyard outside they had a large selection, each with a different style. At the time, also about two years ago, they were very inexpensive. If I recall it was only around $30. My vision for the rest of the surround was brought to life with the help of Metrie moulding and trim! 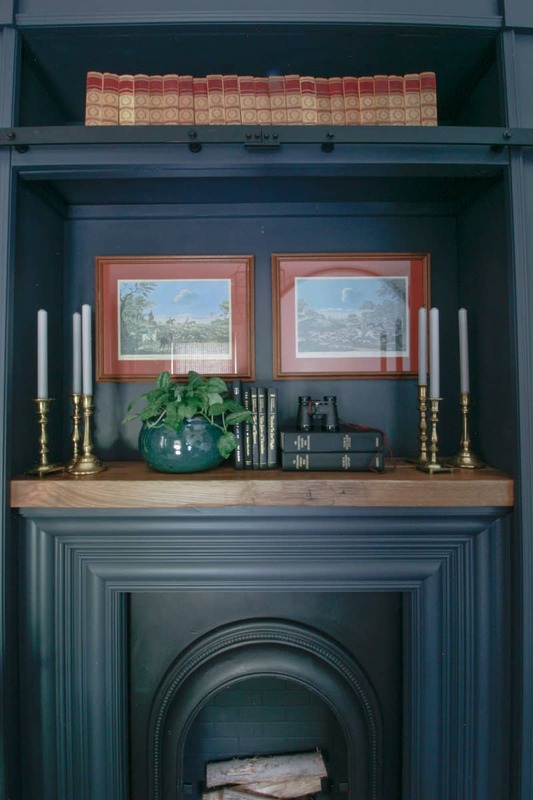 There are four layers of gorgeous trim encasing the fireplace. 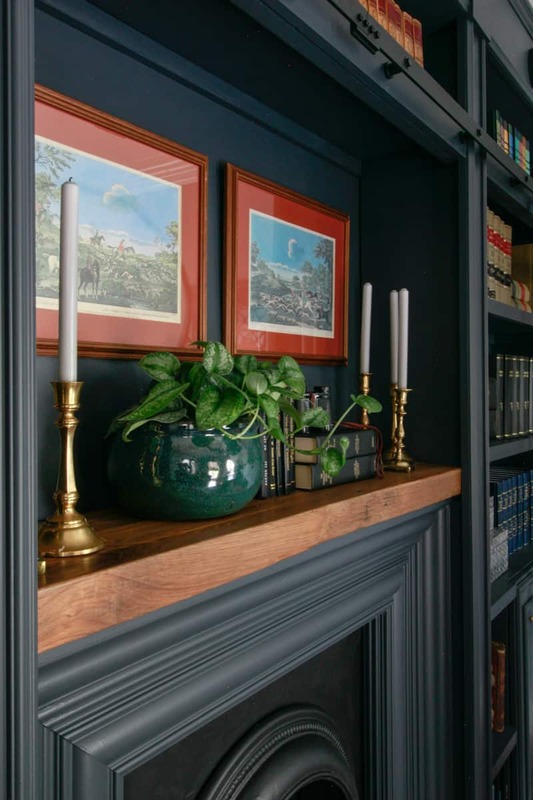 The moulding details that enhance each section of the library bookshelves as well as the cabinet doors were also from Metrie. 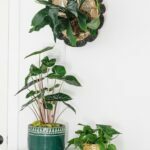 I love that they offer an extensive selection of styles of high-quality, unique moulding! Each of the pieces I used were from the French Curves line. To cap off the top of the mantle I purchased some rough cut red oak from a local reclaimed wood store, Evolutia. I planed and sanded the lumber just enough so that it was mostly level and smooth, but left as much of the character as possible. 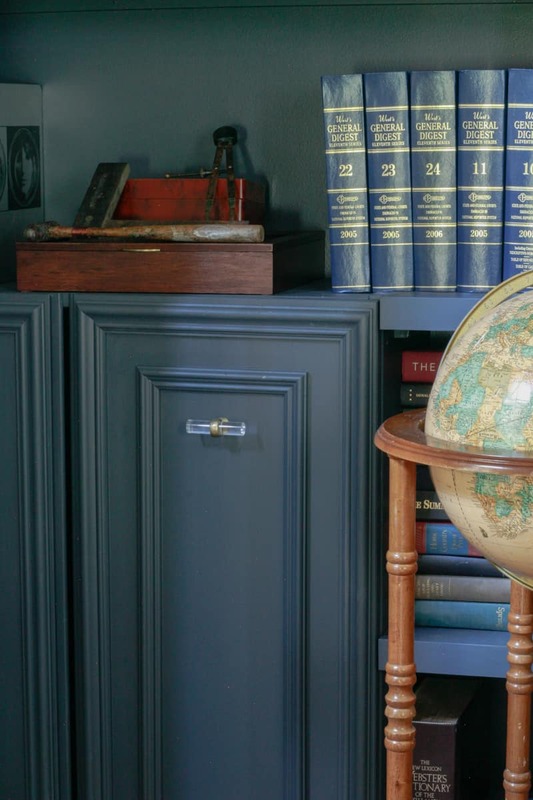 A clear top-coat was all it needed with the natural rich color and patina. Here is a good look at the inside of the doors. It was an intense process to remove the many layers of likely lead paint from the doors and restore them to this state. My husband replaced his beloved leather chair with a new-fangled recliner in the basement media room, so it got a second chance at life in the library. 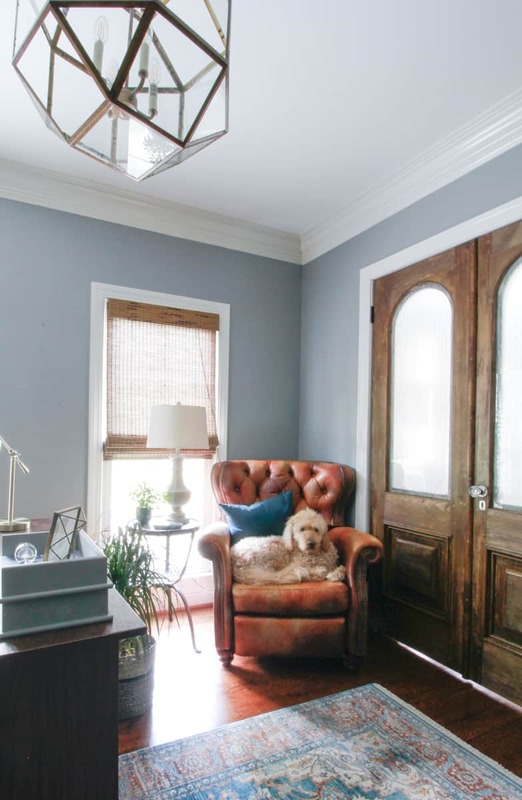 It’s kind of nice to have a place to sit for a conversation or to read a book or for a dog to take a nap! Here is a look back at the before photos of the room. There isn’t a shot of other side of the room because there was absolutely nothing there! Thank you all so much for following along with this crazy, but totally amazing event! I appreciated your feedback and support during these long days! I am so thankful for the support of my husband and my family who make all this fun possible for me! 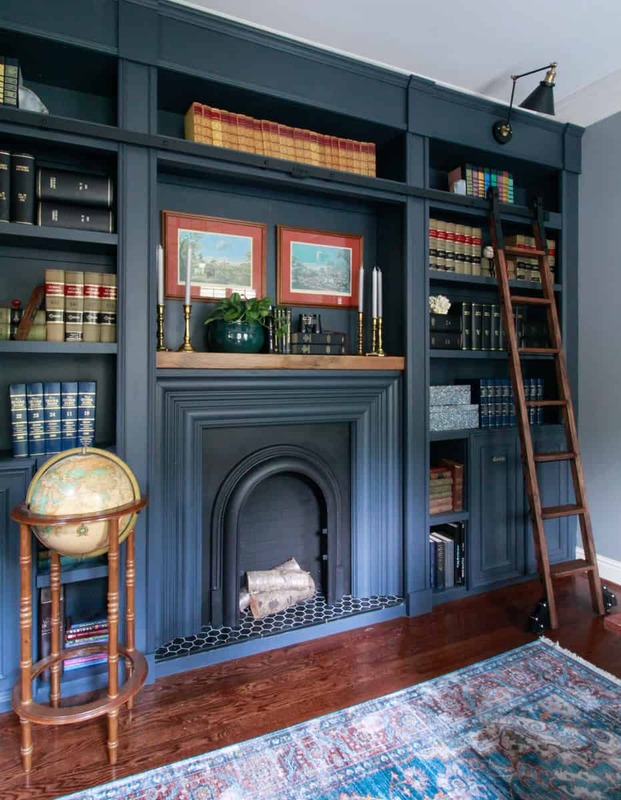 Many thanks to my two sponsors for this challenge, Metrie for the beautiful moulding that completely elevated what could have been an ordinary bookcase wall. 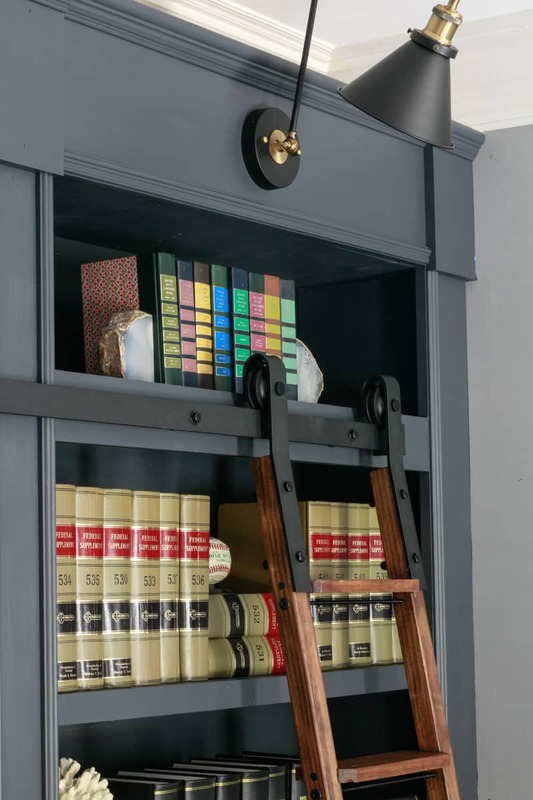 And to Ryobi Power Tools whose continued support helps make builds like the library ladder and the installation of the moulding quick, easy and fun to do!! 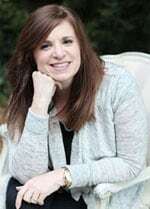 Of course I would like to thank Linda for creating and for nurturing my favorite design event, the One Room Challenge. And a huge thanks to the media sponsors House Beautiful and the Home Love Network!! Now it’s time to go and see the Guest Participants, here, as well as the Featured Designers, here!! You will not be disappointed! I promise! I’m envious of your rolling ladder! 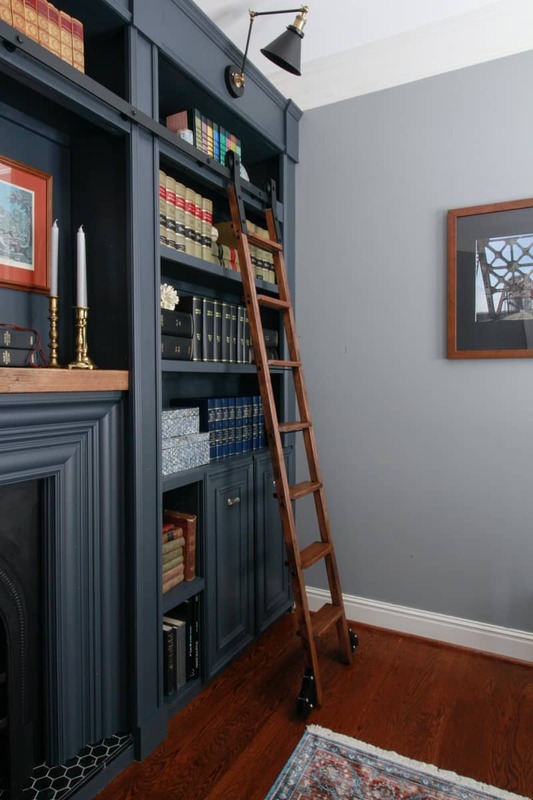 The ceilings in my own library are too low, so we had to settle for just leaning a decorative ladder against the bookcases. Love the deep color. I’m sure you’re enjoying your cozy new space! 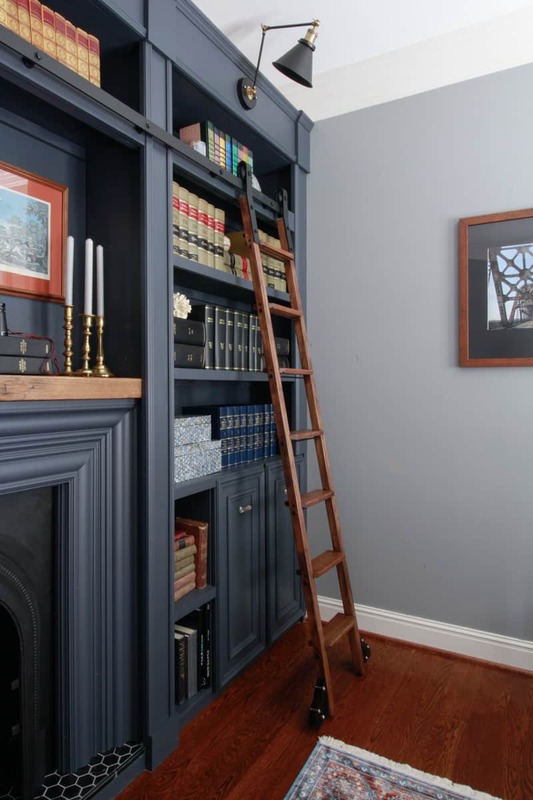 The moulding, the colors, the ladder! It’s all so dreamy. Beautifully done! It is so beautiful! Well done! So proud of all the talent in Birmingham. Go Magic City! I was following you before I knew you were in Birmingham and I was so thrilled when I found out! Leslie, your library is absolutely beautiful. It’s been fun to watch the amazing transformation. Great job!! I freaking love that colour! That ladder is fabulous. It is a great color, and combines nicely with the wall color too, I think. Thank you! YES!!!! This turned out so very great! I love the moody colors and the ladder!!!! Thank you! Libraries are meant to be moody right? YAAASSS to a library ORC! Solidarity!!! Excellent job!! congratulations! Yes!! Somehow I had forgotten about your library until a couple weeks in! How dare i?? Loved yours too! Leslie, this library is beautiful! You are so talented and creative! 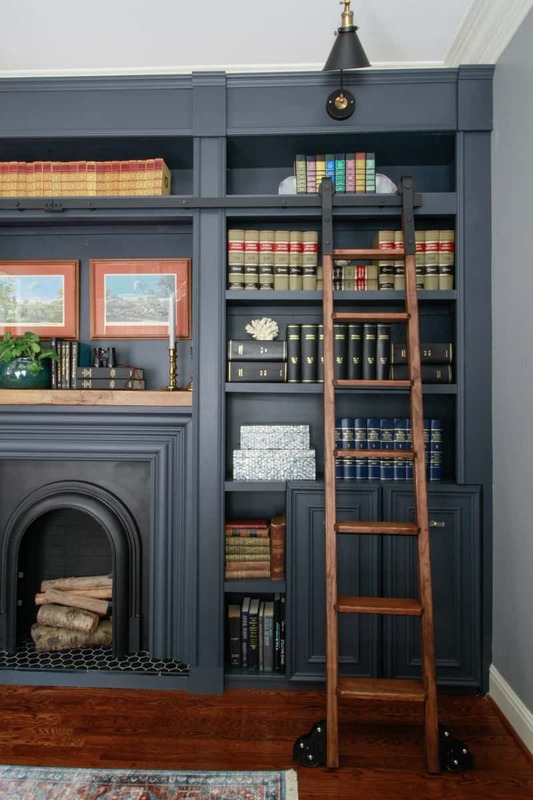 Love the rolling ladder and faux fireplace! Marvelous makeover! oh it’s stunning! i love the details and the color! Leslie, I am blown away with this this room! This is the best office makeover that I have seen. I’m serious! The color you chose is beautiful and I the rolling ladder is so clever. I love those doors. 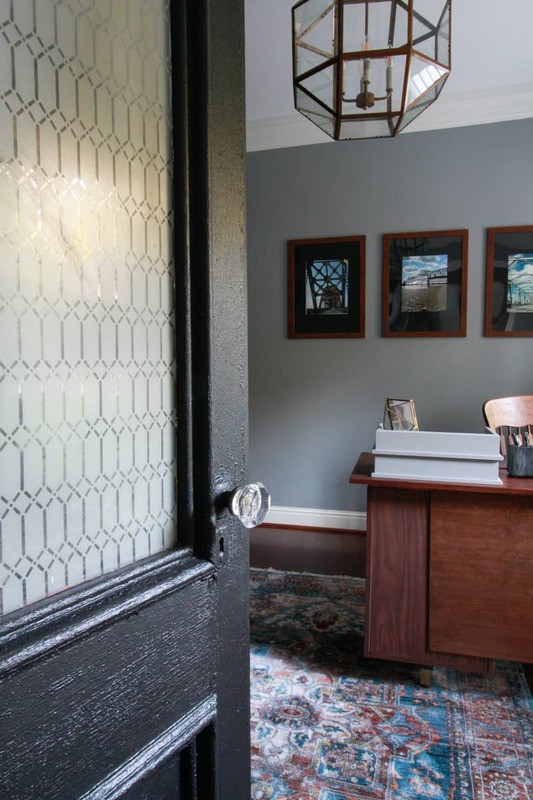 I know your husband must loves his new office. Thank you Sherry! What a wonderful compliment! I didn’t want to use a kit to build the ladder and it wasn’t too hard to design and build but the outcome was pretty good, huh? Really lovely, I love the deep colors! Thank you! 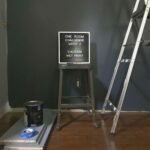 It is a perfect dark grey blue! What a huge transformation!! I don’t think I will ever get over how amazing your built-in turned out. And that ladder! Oh my gosh. I just can’t. Nice job! THank you so much for your awesome comment. Your enthusiasm gave me a huge smile! I hope you stay tuned for the tutorials on how to build it all! Everything turned out so wonderful! 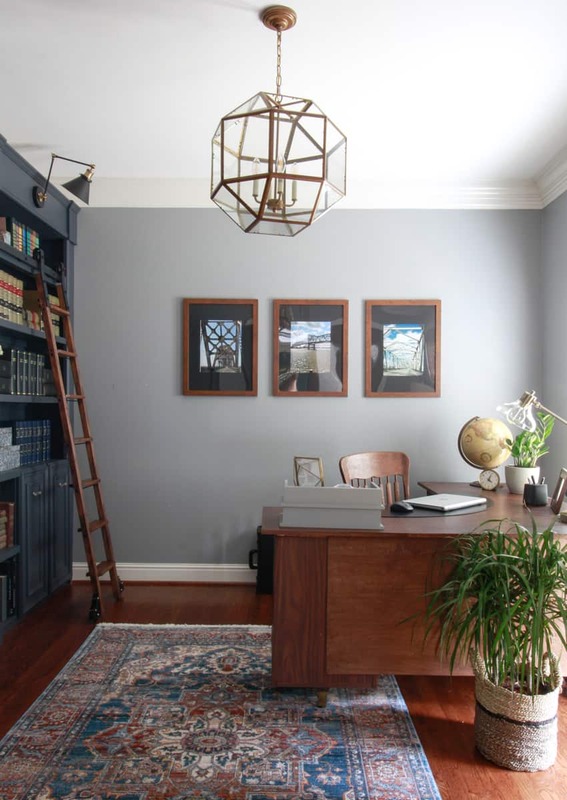 I’m loving the built-in wall and your dreamy office space. Great work! THank you, Sarah! He is pretty lucky to get to work in that space but he deserves it! This is one of my favorite rooms ever! It’s so cozy!! 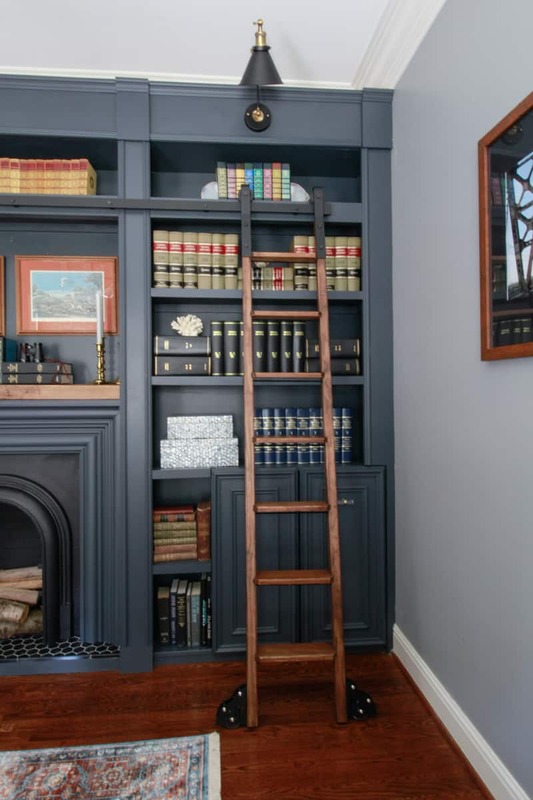 I love that library ladder so much! Great job! Wow! Thank you for such an amazing compliment! I really appreciate it. I absolutely adore those doors! Your built-in is fabulous as well! I wouldn’t have done anything different! Thank you!! I am so pleased the way the vision came to life. Love when that happens! Great makeover! So bold and beautiful! Thank you!! I dreamed of that dark color library for a long time! Absolutely gorgeous! I love the fireplace insert especially the way you built it in. Actually, I just love it all.? THank you Nancy! I took special care to make it look as realistic as possible glad you noticed! THank you, Laura! The cabinets were Ivars from Ikea that I embellished with the trim from Metrie. Super inexpensive and the shipping was very reasonable too! If you look back at week 2 or 3 I think you can kind of see how it all was built. Did you use the rollers somewhere? 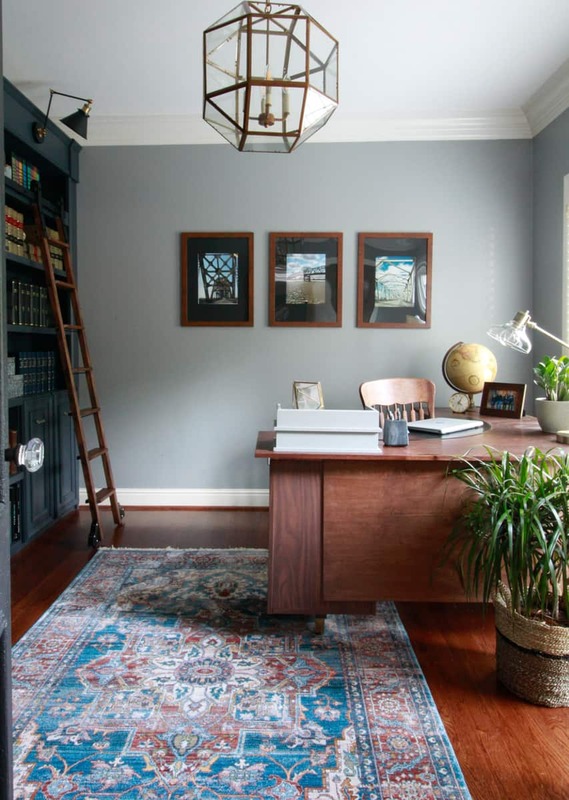 Your library/office makeover is stunning. I am from Huntsville, AL, but have lived in TX for over 40 years. My family still lives in AL, and I visited Southern Accents in Cullman with my brother a few years ago. I bought one of the fireplace inserts, too. This Christmas I plan to use it as a display piece in my annual French Country Christmas Event. All of your work on the makeover is beautiful, and I enjoyed seeing it. Thank you, also, for stirring memories of a great trip to Cullman with my brother. I am so happy to have you following and so glad I was able to bring back good memories. SA is a great place to find special treasures! 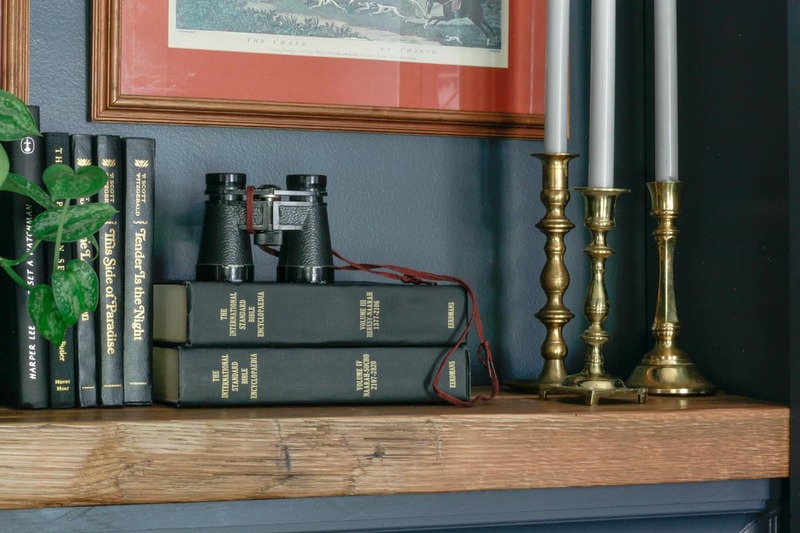 Were the fireplace inserts inexpensive like I remembered?? I bet it will look great in your display. I’ll share a tutorial on how I built it all out. I don’t see why you couldn’t build it like a box you take with you if you wanted. THanks again!! 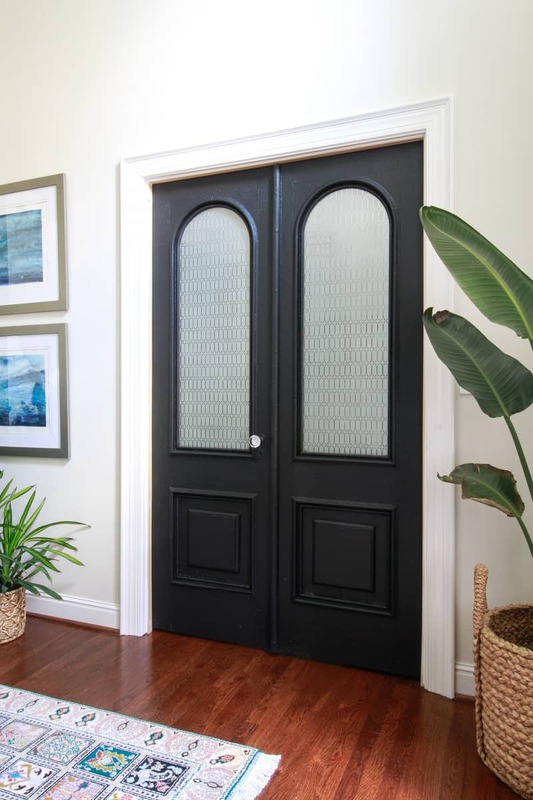 I need those doors pronto! This library is perfection! I love it! Those doors are quite special aren’t they? Thank you!! This is fantastic!! Well done! Awesome!! I’d love to see it when you are done. Look for the tutorial for the ladder soon. It took a while to build but not particualarly hard but I saved a ton of money!! I was going to subscribe but there are too many moving ads – they made me dizzy. Too bad because your blog looks interesting. I am sorry to hear this. I would invite you to follow me on social media then.Unfortunately, the ads help fund my projects and allow me to create content for the blog. 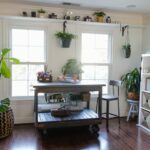 This space turned out beautiful. I love builtins and you did such a great job styling them! It has been fun to watch the transformation. Leslie!! This is all so beautiful and I couldn’t wait to see the final reveal throughout the ORC. 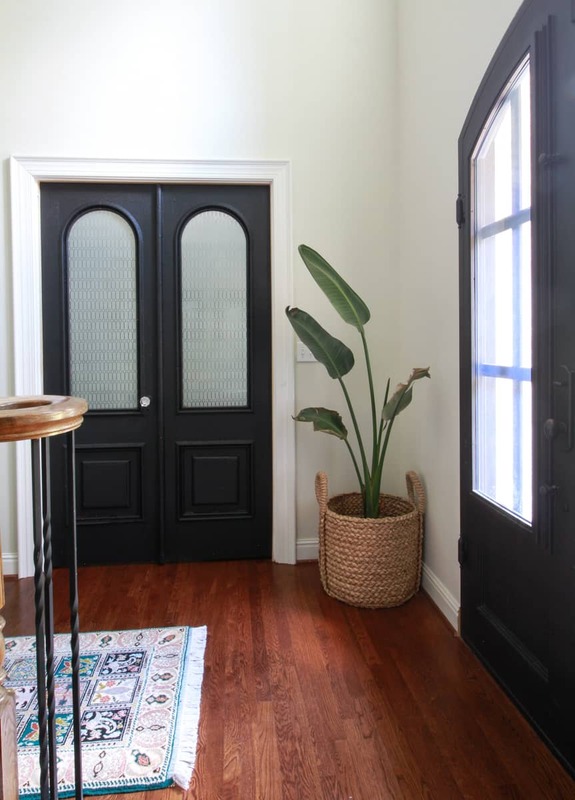 I love how the doors came out and that you painted them on the foyer side and kept them in their lovely wooden state on the office side. The built ins in that glorious color! And the fireplace! And the ladder you built with your dad! And the light! And the cute pup! How am I to choose a favorite? I just can’t. It’s all gorgeous! 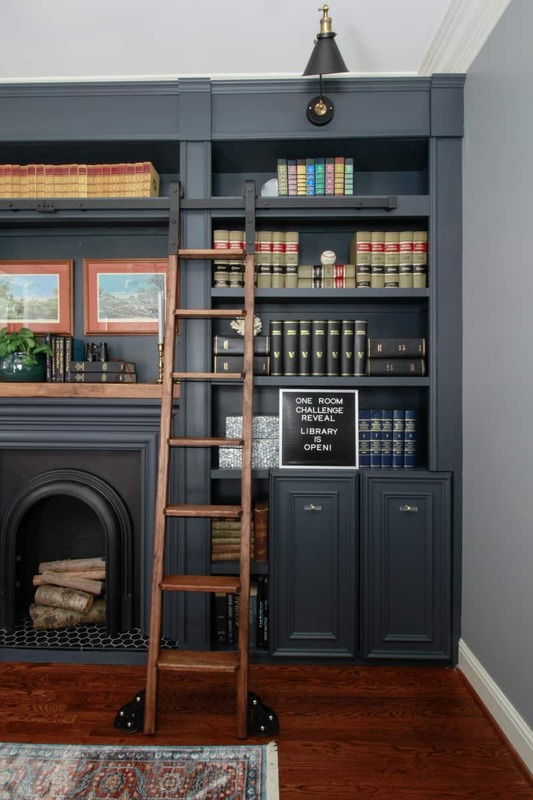 The bookcase wall is amazing! Great job, love the color!!! The doors are amazing. The built-in are beautiful. The fireplace is fabulous. I could go on and on! I love love that you did a study. We had a room like this when I was growing up and it was my favorite room of the house. It looks classic without feeling dated. Beautiful. WOW! What a beautiful space! 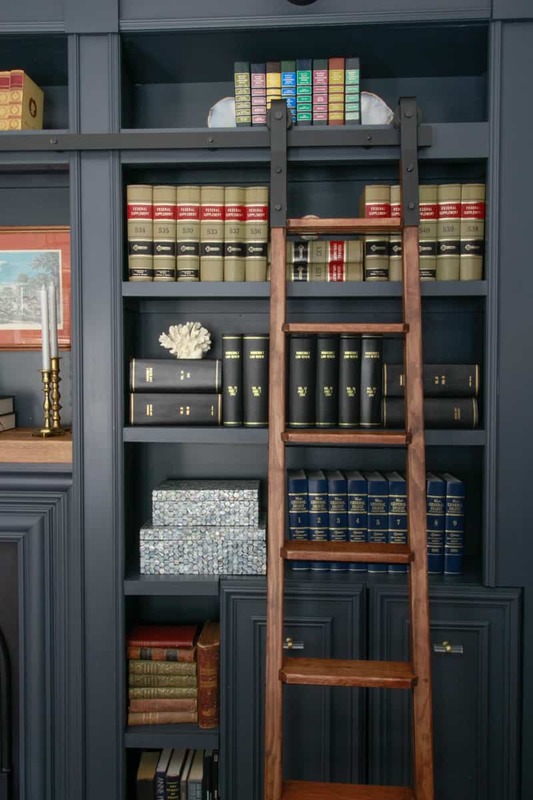 That library ladder is so fantastic and so sweet that you and your Dad did that together! That ladder! The fireplace! I love the pictures of the bridge old and new, such a wonderful tribute to your home town. 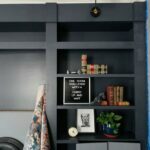 The shelves…the room is amazing!!! Congratulations on a beautiful makeover!! 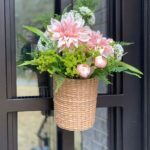 I’ve been so excited to see your full room since seeing it on Instagram, and it definitely didn’t disappoint – it’s GORGEOUS!! 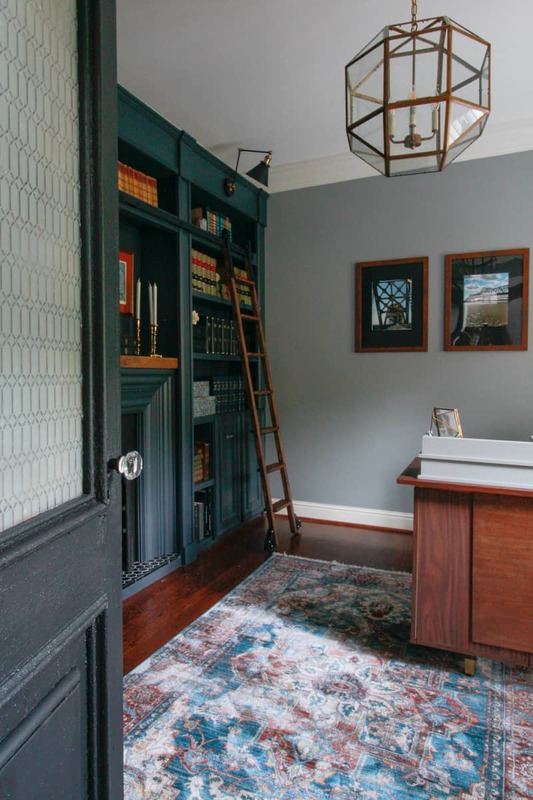 I am in love with those antique doors, but I can’t decide if they beat out the gorgeous built ins and fire place. The color you picked is perfect. Beautiful job! Absolutely beautiful! I’m in awe of your work ethic and design ability. 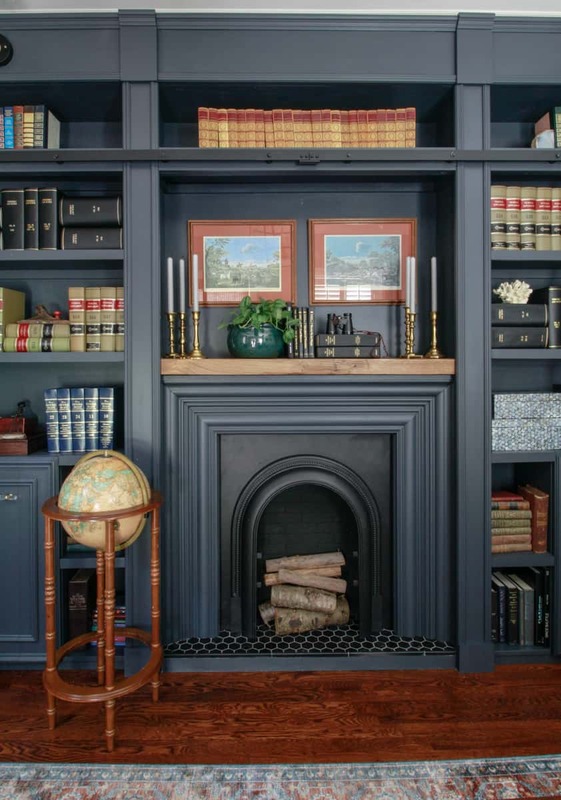 If I ever get up the courage to paint the teak bookcase in my library, I’d like to use this color. I just reread all the posts, but didn’t see where you mentioned the color/brand. 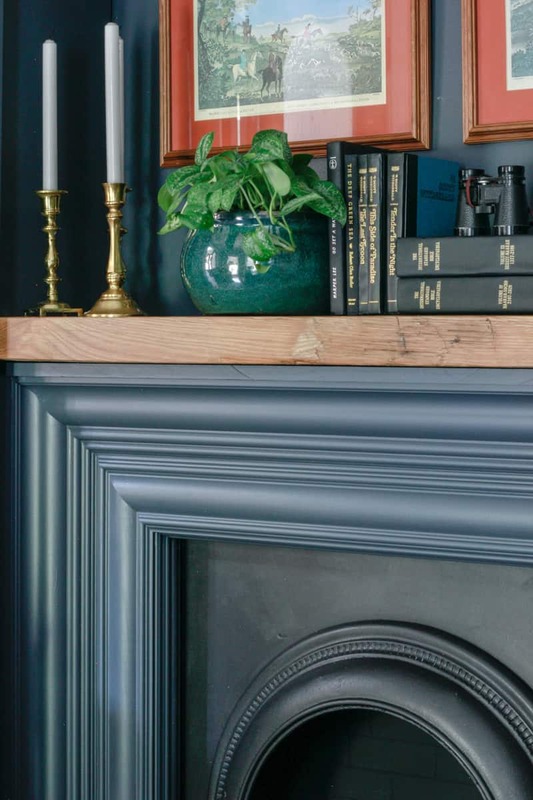 Also, could you say exactly what Metrie pieces you used on the fireplace surround?I went to their site, but it was hard to figure out which ones. 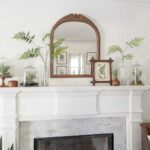 What brand/color of paint is on the mantel? Love the room!